We all wonder as we wander. We all have a natural curiosity about what exists, how we can best interact with it, and what the future might bring. We wonder how we and our loved ones can best survive, can best be successful, can best be happy, and can best be prepared for tomorrow. When we wonder, we are open to learning and it is through learning that we can improve our lives. Prehistoric humans wondered too, but their main concern was surviving in the natural world and dealing with the small number of people nearby and a few strangers. Today, there are a whole lot more people nearby, and our understanding of the natural world has grown rapidly and gotten much more complex. Our lives are growing more complex technologically at a mind-boggling rate. Technology has substantially improved the length and quality of our lives, but we have a whole lot more to wonder about than our ancestors had in order to adapt, to survive, to thrive. Science is simply a method for wondering logically. Under the scientific method we make observations. These observations lead to interesting questions to wonder about. We formulate possible explanations—hypotheses. Then, based on these hypotheses, we make predictions that can be tested. We make more observations, gather more data, do more experiments, refining our hypotheses and their predictions. Over time these hypotheses grow into theories that seem better established and more widely applicable. 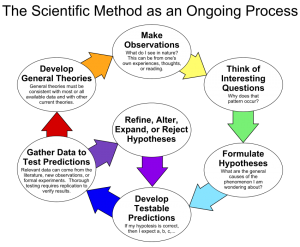 The scientific method has played the primary role in conceiving of and implementing new technology and new social structures, and science needs to play an increasingly major role in the lives of each of us as we wonder. Science is a journey not a destination. Enjoy the journey. Smell the roses along the way. Don’t fear science. You do not need fancy mathematics to do science. Just wonder logically. Previous Post: Do Greenhouse Gases Actually Warm Earth? Prove it!